Some bands just keep plugging away, ever so slowly altering their sound until something falls into place. Such is the case with Nox Aeterna. Hailing from the Netherlands, they’ve been around since the early 2000’s, honing their approach to its current form with their second full-length album, The Desperation Deal. It appears the band has hit their sweet spot, with The Desperation Deal providing a solid round of melodic death metal. Ushering forth a conceptual album, The Desperation Deal consists of 4 parts – each beginning with a quiet, instrumental opening. It serves as a nice break in the action from time to time, especially considering there are 15 cuts to digest. 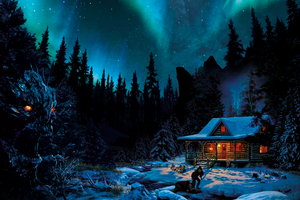 As for the heavier bits (which is what everyone’s here for right? ), most listeners of melodic death metal should have no problems getting behind Nox Aeterna. There’s bits and pieces from Amon Amarth and Dark Tranquillity that definitely come to mind quickly, though it’s not aping either one. The riffing tends to stick to the more uptempo range, offering up some thrashy bits and some nice flair from lead guitarist Debbie Maasdam. There are also some symphonic elements that the band use, but they never get too “upfront” to the point where they get in the way. This is a nicely guitar-focused effort (with the chops to back it up). 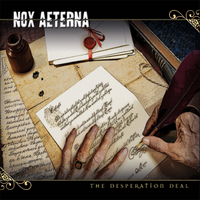 While nothing really approaches outside the box territory, Nox Aeterna cover all the bases and do it well with The Desperation Deal. Killer riffs, snarling vocals, acoustic and atmospheric moments, it’s hard not to enjoy this one to the fullest extent. Let’s see if they can up the ante even further with album number three.